Kolkata: Over a hundred devotees on Thursday participated in the International Society for Krishna Consciousness' (ISKCON) celebrations to commemorate its 50th anniversary. 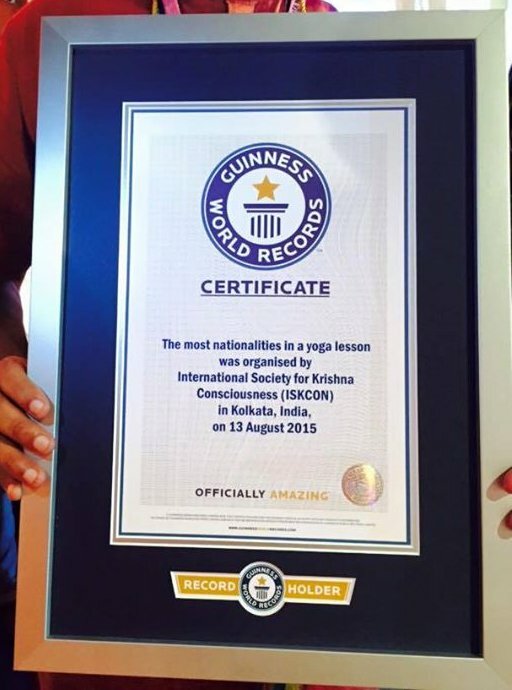 Devotees from 106 countries practised bhakti yoga together at the Kshudiram Anushilan Kendra here, creating a record for "Most Nationalities in a yoga lesson" with the Guinness World Records, while another 105 devotees sang Bengali choir to set the record, ISKCON vice-president V N Das claimed. 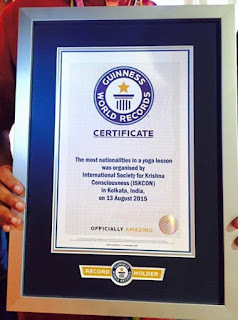 "Inspired by the fact that in June India created a world record in New Delhi for most number of people participating in a yoga lesson, we today decided to make yoga more popular around the world by creating another record for the Guinness World Records. And today we are happy to say that we have successfully done it," Das told PTI. The three-day celebrations, which started here today would be observed across the globe along with the 'Journey to West' of its founder Acharya A C Bhaktivedanta Swami Shrila Prabhupada. West Bengal Governor K N Tripathi and other distinguished personalities from different fields were present at ISKCON's cultural programmes, as part of its celebrations held at the Netaji Indoor stadium here today. It was from this city that Prabhupada left India on his historic journey to the West at the age of 69 on August 13, 1965 to preach the message of God Krishna to the world. In 2016, events would be launched around the world to celebrate the 50th anniversary of Prabhupada's founding of the ISKCON, in New York City, on July, 13, 1966.